New to adult coloring?? Make sure you stop by and read up on How to Choose An Adult Coloring Book! Do I think they are worth the money?? Absolutely! If you are going to be an artist…… and yes adult coloring is very much an art! Then you must have a set of good colored pencils. I couldn’t believe the difference when I bought mine and used them the first time. The first time I picked one up to use it I thought these better be good! The minute it hit the paper and the rich silky colors hit that adult coloring book I just about collapsed (just a little dramatic here) but seriously in my opinion they are well worth the money!! Check the reviews! As always Amazon can change their price at any time, so check the price before you check out!! They do ship free with Amazon Prime. 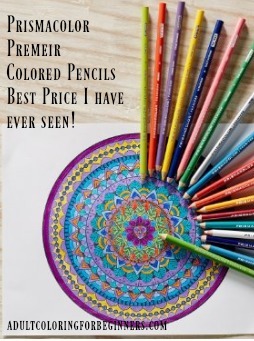 Prismacolor Premier Best Price I have Seen Sale on Amazon have you seen it cheaper anywhere else?? Don’t forget to sign up for my email updates to stay up to date with AdultColoringforBeginners.com! Hello! I'm Bekki! I absolutely love adult coloring and am here to share my best coloring tips and tricks with you. I am a married mother of two beautiful girls who also share my coloring passion.